Printing on good quality rag based papers is an expensive exercise – especially if you have a ‘bad printing day’ – I know this from first hand experience. Some days I just clean up and leave it when it keeps going wrong. So I can well understand why linocut artists edition some of the less successful prints. But it can also be an experience thing – as you get more experienced in printing you learn what can be better achieved and then raise your expectations on what you see as an acceptable ‘editionable’ print. This has certainly been my experience. All of the following ‘flaws’ in a final print would cause me to discard that particular print from an edition. However, if careful then issues such as ‘missing’ a couple of small dots in the ink surface can be overcome through further burnishing. It is a matter of trial and error to see how you can overcome some of these imperfections and create better prints. Unless the flaw in the printing is either deliberate or by accident it creates an effect that enhances a particular image (but in an edition you would need to repeat the ‘accident ‘ to ensure all prints are as close to the same as is possible in a handmade artwork), any print that is not well printed you should consider discarding from an edition. 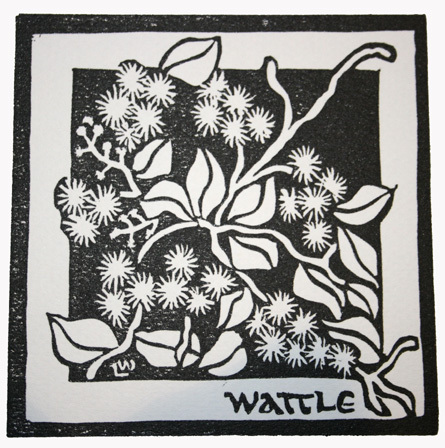 That all being said there is a certain ‘rustic’ quality to a hand pulled linocut – it is handmade and small imperfections are part of the ‘charm’. I am by no means a master printer – they are just amazing and many many times on a ‘bad printing day’ I wish I could afford one! I struggle with printing – some days you get into a zone and it all goes so well but often I find that can be on the last couple pf prints for the day!! 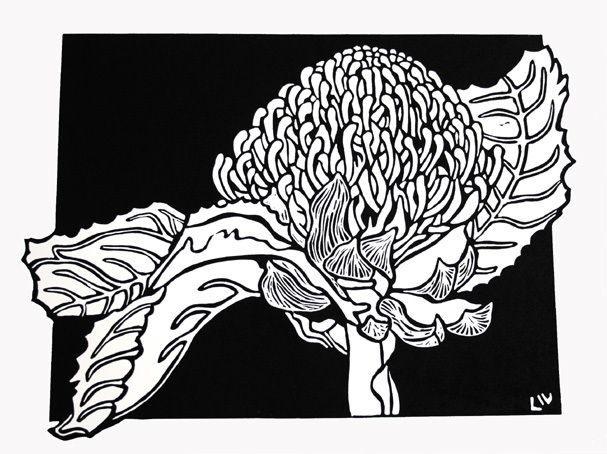 I do however also believe that as an artist printmaker I should print my own linocuts – so persisting in trying to improve my printing is something I strive to do. 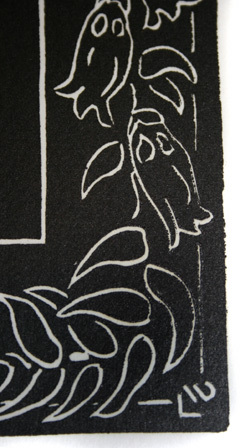 As I pointed out in my last post the linoblock has a hessian backing. It is really important to ensure any ‘stray’ piece of that backing are cut off neatly. This includes stray fine ‘hairs’ from the backing. These can be a problem around the edgeline of he linoblock print as they can pick up ink in the process of inking the block and transfer to your final print. 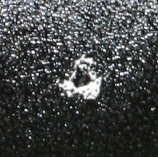 Also check your edges are neatly cut if that is part of the image as this can give ‘fuzzy’ edges.. In this discarded print you can see small white patches where the ink has not been evenly applied. 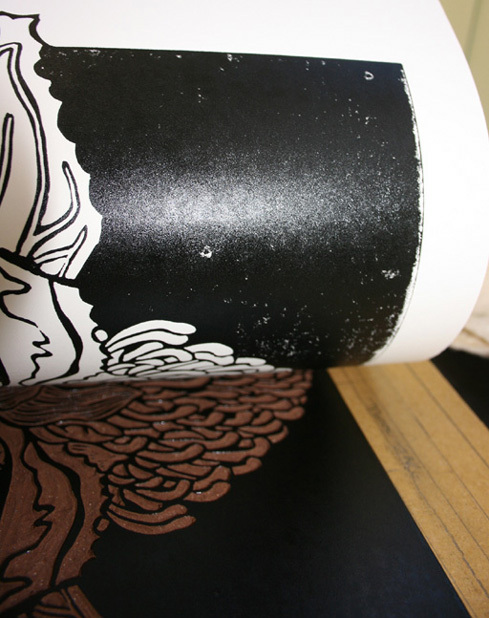 Essentially the aim is to get an even coating of ink transferring from the linoblock to the final editioned prints. There will nearly always be small imperfections in hand pulled print, however, in the wattle print above and the close-up of another print below – this level of uneven printing would indicate that I needed to discard these particular prints from an edition. Also check your roller has no imperfections (small indents, chips) causing small areas to not pick up ink evenly and therefore not transferring ink evenly. If hand burnishing then try and make sure you work in a pattern across the print. With a press sometimes turning the print around running the print through a second time helps if the press is not giving even pressure. The above problems with uneven pressure can also be caused by not putting enough ink on the linoblock or missing sections – as seen on the left. 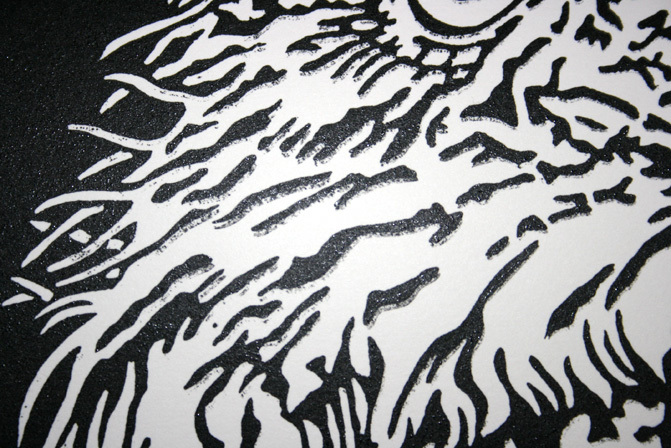 The opposite can also occur with the over-inking of the linoblock – as seen on the right. This can happen as easily as under-inking ! It is essentially when you try and roll too much ink on the block – this could be to avoid under-inking. It means the finer carving work such as fine lines “fill in” or you end up with raised lines of ink around the edges of the carved or white sections or you can see a ‘texture’ of ink on the surface of the dried print. I find viewing the inked linoblock against the light to check the ink levels can help – sometimes you can see some of these problems – add additional ink or print this over-inked block on cheap paper and remove excessive ink before moving back to the editioned prints. Wow, very helpful information and gorgeous prints too! Thank you! Zwischenzeitlich bin ich echt froh diese Website gefunden zu haben. Das wollte ich jetzt einfach mal loswerden 🙂 LG. Glad to help! Thanks for the feedback. Beautiful prints and really useful tips….wonder if you can help me with this problem please? I am in the process of cutting a new lino and have made a mistake in the cut, is there any way I can ‘correct’ it as I really dont want to start over, could I fill the cut temporarily and if so with what – Any suggestions……? Mistakes can be a problem…been there!! If it is small and you still have the piece of lino you can superglue it back in and adjust the design around it. I had a lecturer at college who used wood filler sanded back smooth but I only tried this once and it was not that successful but it was a long time ago. You can also look at ways to work the ‘mistake’ around in the design to make it work – I don’t know if this is possible without seeing the design. I now work my designs pretty much before I start carving and am careful to check back – sometimes even then I cut the wrong section but have always been able to work back around it fortunately. I must say starting over may not be ideal but I have done this and often the carving is better the second time around if this is any consolation. Thanks Lyn, I had considered whether something like filler might do the job, but at the end of the day I know I probably won’t be happy with the print, I think you are right- bite the bullet and start again! I use wood filler in my wrong cuts, sand it with very fine sandpaper paint it over with quick drying hobby paint or any good paint. It works perfect. Lasts for at least 50 prints (I never printed more than that). Thank you for your very helpful advice. 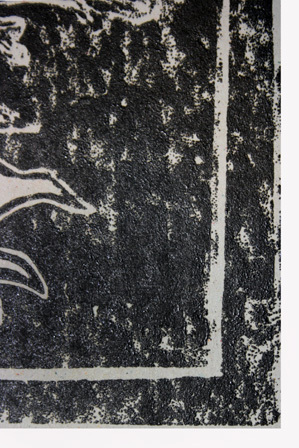 The lino has a waterproof surface on it that can be lightly sanded (described here – https://soulsongart.wordpress.com/2010/10/16/currently-carving-some-of-my-lino-carving-methods/) – you can use a very fine wet sandpaper and lightly sand back the surface. It might be worth a try – let me know how it goes. I haven’t had this problem. Thanks Lyn, I appreciate it! I will try the sanding idea. Just reading the question posed by Pete, I also used to get this problem with inking the lino but now I always sand back my lino with fine wet & dry, I drop a little water onto the lino and gently rub away until I get a fine paste over the surface, which can be wiped away with a cloth. The surface is ready when you can drip water onto it and it doesnt just sit in a bubble but rather covers the surface……. hope this is useful. By the way havent had time to start my re-cut yet!!! Thanks for that info – that’s what I suggested to Pete, glad to know it worked for you! I must say I was starting to handcolour a new print today of Australian Floral Emblems only to discover I had left out the ACT Bluebells out of the design & carving with no room in the carved design to fix it!!! All I can say is arghhhhhh!! Will be doing a bit of recarving of a whole block myself!!! Great information Lyn! 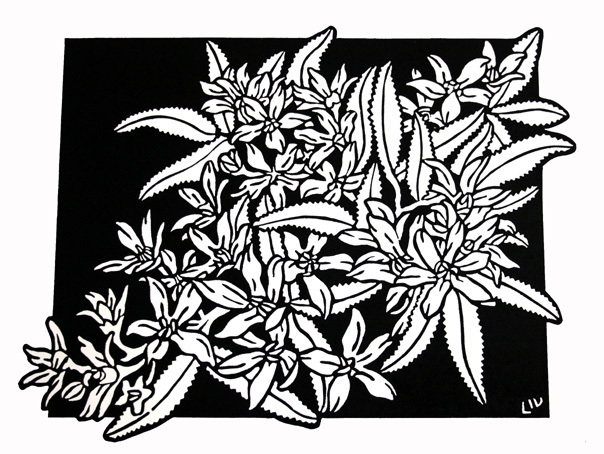 Thank you for sharing your experience with the linocutting world. I work with water-based ink quite often, as I like the finished product (not shiney) and it’s a much easier set-up, clean up, etc. However, I often have a problem with under- and over-inking; a very fine line. Any suggestions for the artist working with these water-based inks? Thanks in advance and brilliant prints! Hi Kona – thanks – keep a lookout over the next week or so as I am in the process of compiling and created a more static blog with the tutorials on it. Make it much easier for people to find the information as it is set out with indexes etc. I have not used water based inks a lot but i do understand the difficulty. you might like to try a different brand of ink that has a thicker consistency. I have recently bought a small tube of a German water-based ink – aqua LINOLDRUCK to do a bit of experimentation. Will blog about it when I get a chance. Hello, your prints are wonderful and your advice is spot-on. My name is Rick Minard and I have recently gotten back into linocut printmaking after many years. I was wondering if you had any advice about keeping the linoleum from curling. Is this whilst carving – and has the lino been kept in a roll rather than flat? You can glue the lino to a flat base – piece of wood cut to the same size. 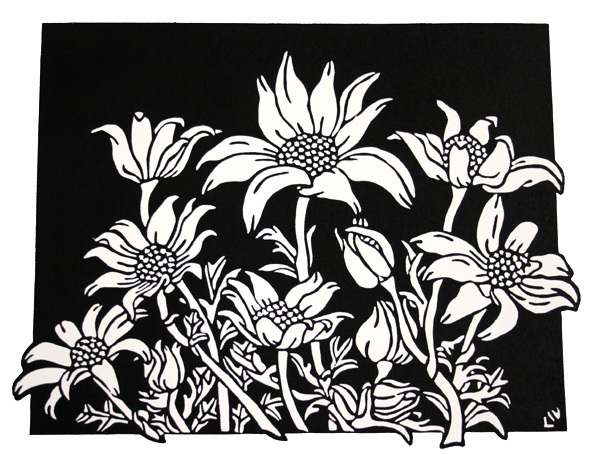 This gives you a solid flat surface and is especially helpful when you are carving a block with very little black in the design, multiple colour block prints and reduction linocuts as they are all requiring close registration (lino is pliable). Keep a lookout over the next few days I am almost finished editing my new blog – I have put all the linocut advice/tutorials into one blog in chapters etc so it will be easier to find the info. Thank you for your reply. I am doing two color reduction prints – short runs – between 4 to 8 prints with many proofs. Sadly, due to space, time and budget constraints, I am not able to glue the lino to a block of wood. I experimented with the idea of scoring the back. Now the lino is cracked in half. Oh well. The best I’ve come up with so far is piling a stack of heavy books on top for a couple days. mmm would not recommend cutting the hessian backing as this holds it all together. Some people use offcuts – I know our local Bunnings has an offcut bin out back near where they custom cut timber for people – may be work a look – or a local timebr yard with offcuts. Essentially I think your lino may have been stored curled up from your description & for some time resulting in it being permanently ‘curled’. I have had this situation but never to the extent that it has intereferred with my printing. I have resorted to using heavy books & then printing as well. Sorry don’t have any other suggestions. I was just re-reading this blog and thought I would let you know how I got on with my mistake! I did try filler, and guess what? it was useless, also tried cutting a tiny piece of lino to infill, also useless Lol! However as the wrong cut was in a large area of sky I actually inked up and printed the design and then using a small piece of cloth over my finger tip dabbed the same colour over the bare patch…..worked a treat! Linocuts/art are like that – not everything works. But the ‘dab method’ lol is something I have used also the main downfall is the dulling of the surface of the ink in the place you ‘dab’. 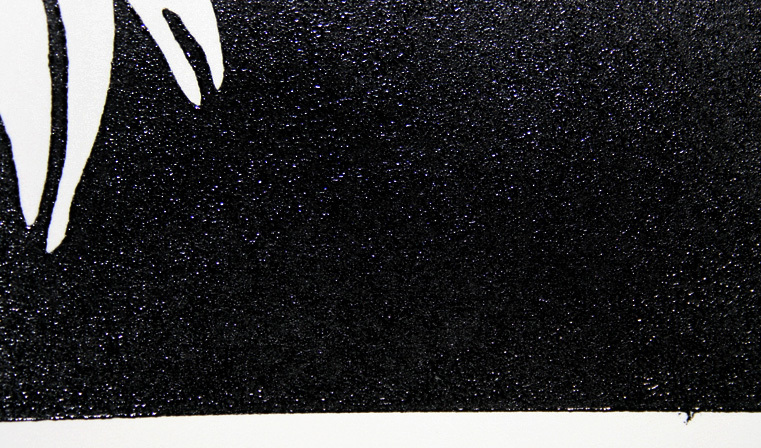 Sometimes if you lightly touch up the small spot – and it needs to be small for this to work – by lifting the edge of the paper on the lino replacing the paper and then re burnish or press you can avoid this. As I use oil based inks if you touch up a section the lustre that remains over the print is dulled or ‘different’ in that spot. It may depend on the ink & paper surface but definitely worth a try! Am so glad it worked for you re-carving a block is well…annoying! Excellent advice. I’m thinking of taking up lino again. I miss it. Thansk so mush for the advice. do you ever use water-based inks, and if so, what is your opinion vs. oil-based? Hi Drew, I did use water based ink a long time ago. Primarily I don’t use them now as I want to hand colour with watercolour & if you use waterbased inks they run when you add watercolour. I also like the deep rich colour & surface of oil based inks. I know this is an old post but I was wondering if u has any advice or could better explaine your handprinting technique. I’m taking an independent study on printmaking at my high school and no one really has the resources to teach me how to hand print my Lino and line it up neatly. Thanks for any help you can give! I have another blog – souslongarttutaorials.wordpress.com – I have basically taken all the posts from this blog & organised them to make it easy to find tutorials. Have a look over at this website & let me know if you need more information. I hope that helps! Your work is stunning, I have completed some printmaking as part of a Cert III in Fine arts that I completed at Tafe, and during the process we soaked our paper before printing. We mainly did drypoint and collagraphs using oil based inks. I am looking to start some lino printing and I am wondering whether I need to dampen my paper as well, and if the same tins of ink with extender can be used on lino. I will be using Arches 300gsm. Hi Lyn I’m having problems with a reduction print I’m doing. I’m using Sakura oil inks, and with the last two colours, its been coming out blotchy. I’ve everything; even inking, sufficient ink (I hope), lots of pressure, working the ink until it hisses, but nothing seems to work. Do you think that the ink might have gotten too glossy to hold, and what can I do? I’ve your work before, and love it! Regards, Brian. Blan, did you find a solution? I’m having the same problem. So frustrated. Hello business electric prices ! You might like to try a site called Wet Canvas where, among other things, they have a Printmaking forum. A great BIG thank-you to you for sharing so much of your vast and wonderful knowledge of the relief printing world ! I just love your blog and tutorials and all the splendid array of information one can glean here. I am lucky enough to have a small book-binding press (bed 25 x 30 cm) and I am trying to get my head around how to achieve consistent placement of the lino block in order to achieve “close” registration, or at least as close as humanly possible. Do you have any advice, please? Hi Graham! Sorry to take so long to reply – been busy with helping family all year. Thank you for your kind comments about my work. I made an A4 sized linocut with large areas that should be unlinked. 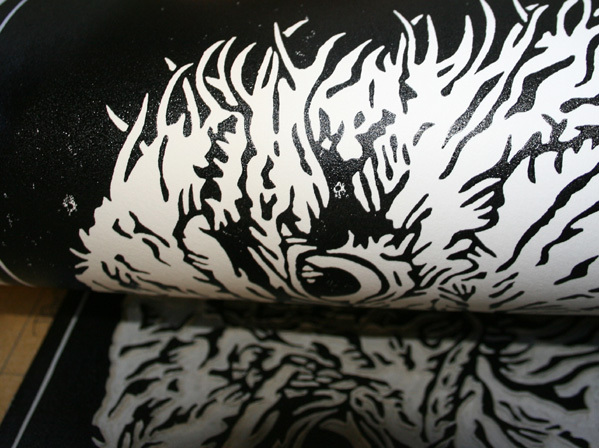 However with a 100mm roller, some of the cut out area has picked up ink and transfers to the print. Should I have a roller at least as wide as the woodcut to avoid this? Hi John, a larger roller that extends beyond the areas may help although ‘softer’ rollers may still pick up any ink that has made it’s way onto the large carved out spaces. You can make sure you carve deeply nearer to the backing canvas of the lino or giving a good depth to the carved sections of the woodcut so the actual raised surfaces can be more easily inked to try to reduce picking up any errant ink in the spaces. Ensuring as little ink as possible is picked up onto these spaces by being very careful when you roll the ink onto the block is also useful. Hi Beth – sorry I am not much help with reduction lino prints. It does sound like the ink is too dry – I use oil based ink as well. Nice blog…I’ll have a good look through this. I like writing as well as printmaking, so will start my own someday soon.